Over the years, one of the traditional benefits of beer versus wine during an evening out is the freshness of beer served from draft keg systems. Wine by the glass on the other hand was usually poured from the bottle, and chances were that bottle remained open for several days, resulting in wine of less than optimum quality. A positive trend has hit the wine industry of late though as the bar and restaurant business discovered the magic of kegged wine. Numerous bars now have a dedicated bank of taps just for wines by the glass, and many wineries are starting to catch on to the trend as well, branching out their distribution channels to include bar kegs as a package option. This month I’ll look at the trend of keg delivery systems for wine, and promote a positive development in diversifying beverage choice associated with an evening’s entertainment. End packaging has long been an issue in the wine industry. While most people are familiar with the cork finished bottle, that package format is actually quite young in terms of its utilization. The wine industry historically stored wines in barrels within the wine cellar. Product was made for local consumption and people would bring a jug to the cellar door to buy, at most, a few days supply. Freshness was maintained by cool cellar temperatures and limited air exposure from proper handling processes at the winery. Oxidation was common though. While bottles existed for some time, the means to seal the bottle and prevent air exposure were challenging. Wax plugs were common, as were oil-soaked rags. It wasn’t until the mid-17th century however that cork bark was utilized as a common tool for sealing bottles. Even then, the practice of packaging wine into cork sealed bottles for shipment, sale, and consumption did not become a regular consumer product until the 1900’s. Yet cork remains a challenging closure with numerous detractors given that it’s a natural product with variations that often lead to wine spoilage from issues such as TCA. While draft systems for beer were common, similar systems for wine faced a number of hurdles. First, wine was not considered a tavern drink. Its popularity as a bar beverage primarily increased just recently with the development of popular food culture in the United States over the last two decades. As a result, large packing formats such as kegs were not even considered a viable product by the wine industry. Second, most bars had a limited amount of available tap space and typically only served a handful of the most popular beers. Again, the rise in food and restaurant culture, especially the microbrewery and taphouse trend, facilitated an expansion of available bar space. The concept is not new. Europe has embraced draft wines for some time. Even the U.S. experimented with kegged wines once back in the 1970’s and again with a couple failed starts in the 1980’s. Where those previous efforts failed, the trend now looks to have staying power. Driving the market is the acceptance of wine as a beverage of choice in bar and restaurant culture, particularly in the female market segment. Also, a number of premium wineries have bought into the format and are capitalizing on the wine by the glass trend, higher margins, and brand development opportunities present in restaurant consumption. The market has also witnessed a number of commercial wine kegging companies come into operation that partner with premium wineries in offering a range of wines to the bar and restaurant industry in ever more cities throughout the U.S. Unlike beer, kegged wine works primarily on a nitrogen gas backpressure system. The low solubility of nitrogen versus carbon dioxide prevents wines from becoming spritzy through forced carbonation. The packaging also makes sense from an economic and environmental standpoint, as less packaging materials are required, and kegs are easily cleaned and reused versus being disposed. Results so far are highly positive as the keg systems keep wines fresh, free from oxidation, and chilled to the proper temperature in climate controlled storage and serving systems. So, the next time you’re out for an evening on the town, celebrate the opportunity you now have in beverage choice. 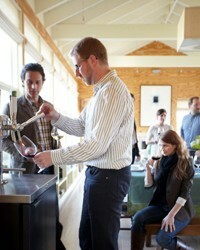 When you ask “what’s on tap?” realize that answer often comes with a full range of wine options as well as beer. All you need to do is find your perfect pairing with chicken wings, and you’re good to go.